How ya doin'? Nice weekend, right? I NEED ( read curious, must know)a block update. Please. How many have you made now? I have 36 made now, as I took a bit of a break this weekend. :) I have about 85 sketched out, which includes the 36 I've already done. Sometimes I think I'll never think of another block, but something always seems to come along. I'm going to do another set of nine (which is how many colors I have now) and then take another photo. I have some small bits of solids I could bring for you at the next PMQG meeting, if you need or want them. Just let me know. Yes, yes, yes! I would love this. 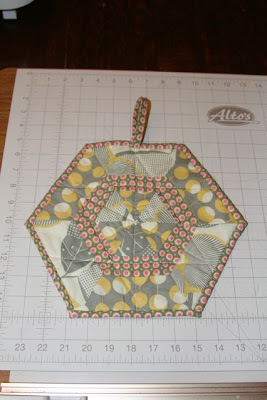 I am putting together my asterick quilt. The oversized blocks that are to be the top 2/3 of the quilt are a piecing challege as I want them to be at different angles and to appear randomly falling. As I am Miss Straight Lines, I am very interested to see how this is going to turn out! Sometimes you just have to let things percolate for awhile. Those asterix blocks are pretty fun! At this point in the process, I was getting pretty serious about sketching out ideas for blocks, and I was worried that I would never be able to come up with enough block ideas. 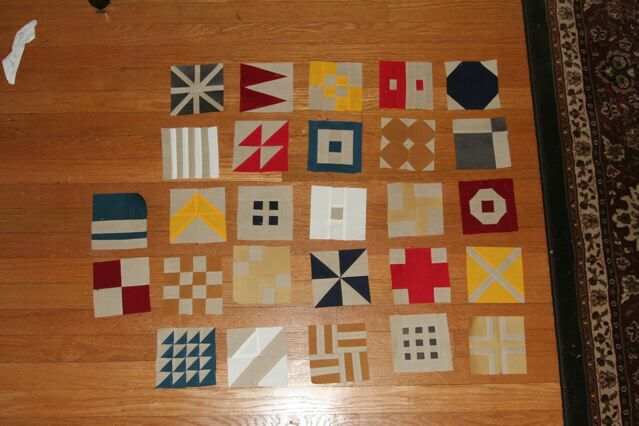 Initially, I paged through the modern quilt groups on flickr, thinking I would make a sampler quilt that was an homage to modern quilting, and included blocks commonly seen in modern quilts. 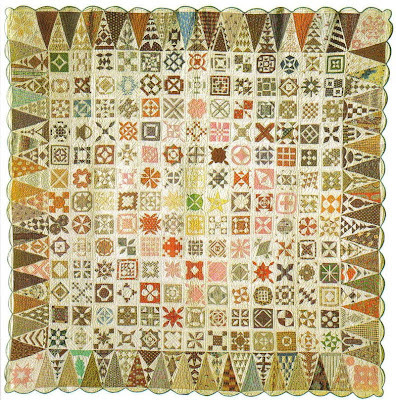 The quilts pictured in modern quilting groups do not have a wide variety of blocks. The blocks that are present often rely on variations in color, rather than shape. I did not exhaustively research all modern quilts, which is a nebulous self declared category, so take from those observations what you will. I didn't get many block ideas from this research. Blocks I did see a lot of in modern quilting were block like the Bento box, disappearing nine patches, half square triangles (usually in one type of pattern), snowballs, and simple combined squares. I spent Mother's day with my dad and his girlfriend, and started numbering my sketches. I was interested in deconstructing various blocks, to see how many ways one type of block could be expressed in a 4 x 4 grid. I was most surprised at how versatile the half square triangle was. At some point, I lost my black pen and started in with red. I also stopped thinking in terms of blocks used in modern quilts. I realized that if I was going to make it to 169 blocks, I had to be open to any type of block that could be made in a 4 x 4 grid. If I could draw one further conclusion about the modern quilt groups, it would be that there is a serious celebration of the fabric itself, and many of the quilts made are to highlight fabric, and to show it off. This is slightly at odds with the idea of a sampler quilt, which, in my mind, is more about the different geometric patterns that are possible in a 4 x 4 grid, so I do not feel comfortable saying that this quilt is especially "modern". I would only call this sampler modern in the sense that I am a person who is alive today, and I am making this quilt right now without the intention of matching any pre-existing style or pattern. This isn't to say that I haven't drawn from the incredible wealth of quilting history, because oh lordy I have. I feel very lucky that I live in a time that all of quilting history is accessible to me at my fingertips. I'll worry about labels later. I also sent Cherri this email on May 7th. At that point, I had 27 blocks. As I look at these blocks, I see why I made them so quickly, as they are less complex than some of the blocks to come. My text is in blue, and Cherri's response is in red. I wonder is there is anyway to post each block pattern on the Ning website and other interested people (me) could play along too? My thinking is that it each block should be very accessible, needing only a rotary cutter, ruler, fabric marking pen (which is sort of optional) and a sewing machine or needle. I'm deliberately excluding wonky blocks. I know they are a big, big part of modern quilting but, to me, they seem very personal. No wonky block is the same as another, and to try and write a universal pattern with them seems difficult (I think it's a personal thing though...). I would think that if someone else wanted to have wonky looking blocks in their quilt, they could choose blocks that would lend themselves to wonkiness and have it. I don't really have written patterns for these blocks, just vauge scribbles in my notebook. Once I shake all the ideas out of my head I'll start getting them down on the computer. Some of them you could make just by looking at them and others need a bit of explaining. By the way, if you want to make one that uses a 3 x 3 grid, just add a half inch (finished) border, and use the inside 3 x 3. We could all add our block patterns there and give them a number/letter code so we can keep track of each block. 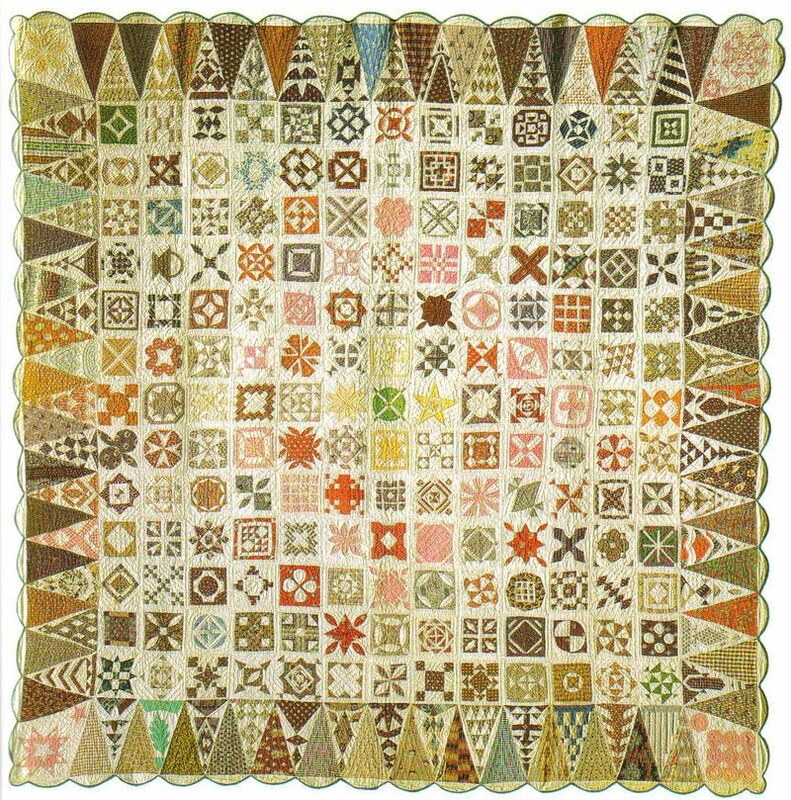 How many blocks was the original Dear Jane quilt? The original Dear Jane was a 13 x 13 grid (not counting the triangle border! ), which is 169 blocks. It will be a challenge to come up with that many! I read somewhere that she used a book of fabric samples that a salesman might use when calling on a dry goods store. That's why the original size of each block was little and the quilt had so many different kinds of fabrics. Can't you just see a whole roomful of modern Dear Jane quilts all with the same group of block patterns and yet each in unique color combinations? My, oh my! Oh yes, I am loving this whole idea! So there we are! A name is born. I'm glad that Cherri went along with it, as that's what I had been calling it in my head. I have a secret crush. Oh, we've never actually spoken, but I love her, and I look at photos of her all the time. She's so pretty. I imagine all the fun we'd have together, and the time we'd spend together. She makes me sad though, because I know we'll probably never be together. She needs things I can't provide. Her name is Dear Jane. I love this quilt. I love looking at it. I love everything about it. I love everyone who has ever finished it. However, at this time, I don't think I would make it for three big reasons. 2. I don't paper piece. 3. I don't like 1/8 or 1/16th inch cuts. The subject of Dear Jane came up a few weeks ago, when I met with Cherri from the Portland Modern Quilt Guild for coffee. She had wanted to see the Freddy quilt in person, so we met up for a chat. We were bouncing around ideas for activities for the guild, and she told me about an issue of a quilting magazine that contrasted photos of traditional quilt patterns with the same-ish pattern done in different fabrics. 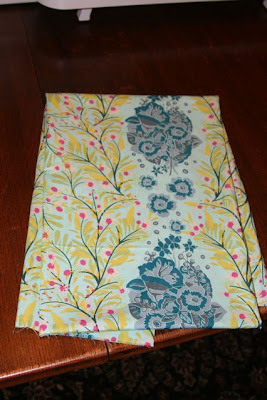 As we were discussing traditional patterns, I brought up how much I love the Dear Jane quilt. 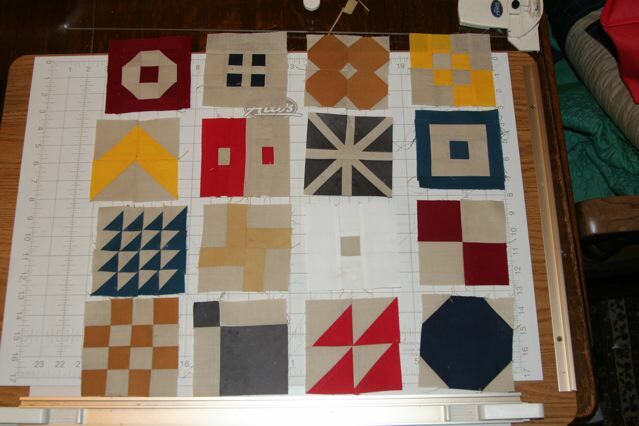 I then got the idea that it might be fun to make an updated Dear Jane quilt. Cherri suggested that it could be a possible guild activity, but I knew even then that I wanted this project for myself. I always surprise myself when I realize that I'm a control freak in creative activities, but I know that I need total final control over projects. I went home and mulled it over, and it felt itchy in my brain all day. I had just bought fabric for my next project, and it was sitting waiting to go, but I couldn't let go of this idea of an modern Dear Jane quilt. 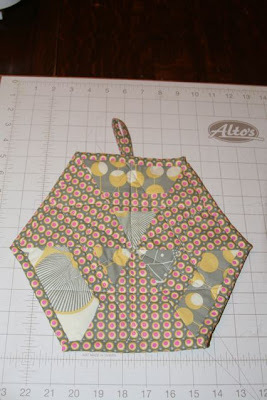 So I grabbed a sketch book, and started looking through the modern quilt flicker groups looking for modern blocks. I jotted them down, and went downstairs to start sewing. I pulled all the solids I had (9), and one neutral left over from my last quilt. I had written Cherri an e-mail telling her about the project through the ning board on May 6th. She responded, and here is the text of the first email with photos I sent her on May 7th, two days after we had coffee. I copied over the questions you asked from the ning board. Are you using the same block patterns as the original quilt? Oh no. They're way to much work for me. All my solid scraps, it ends up being nine colors, including white. 4 in x 4 in finished. I thought that's what the dear jane blocks were, but it seems like they were 4.5 x 4.5 finished, which seems crazy to me because a 4 x 4 grid seems so much easier to plan for! Can you send me a pic or two? And there they are! My first set of blocks for a modern sampler quilt in the style of Dear Jane. If you check out my flickr account, you can see that I have far more blocks now, but I thought I'd post the various e-mails that I sent Cherri with photos to sort of document the process of where this came from. Side note: I have some reservations about using the word modern, because the square has been around forever. I find it hard to believe there are variations that haven't been tried before or are new inventions. When I say modern, I mean blocks that show up in modern quilting more often, or are in fashion now. I really do believe that trends are best explored in hindsight, so it is very difficult for me to describe what modern actually is (meaning, I don't want to sound silly later if I'm wrong). I recently joined the Portland Modern Quilt Guild, and if I were the sort of person that believed in fate, I would say that it was meant to be. I was looking for a quilt group to join, and randomly googled "Portland Modern Quilt Guild", as I'd seen a few posts about Modern Quilt Guilds in other cities. That lead me to a blog posting about how the group was just starting up. We've had two meeting so far, both of which have been very fun. In the second meeting we had a potholder swap. I wasn't crazy about the one I made, but Megan, the woman who got it said very nice things about it to me, so I hope she really did like it. Check out the sweet potholder I ended up with! It was made by Jill, and it is lovely. She even hand sewed the binding on the back. I think it looks fresh and cool. I will also never use it. 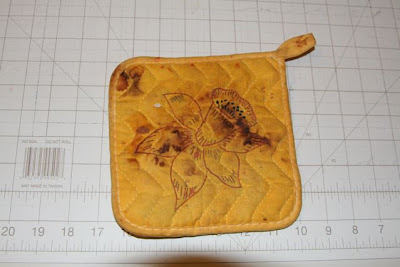 Check out the state of one of my current pot holders. Disgusting! My new pot holder is so pretty that I don't want to ruin it. Before the meeting started I saw that one of the members, Tamara had given another member, Elizabeth, a very pretty pin cushion. 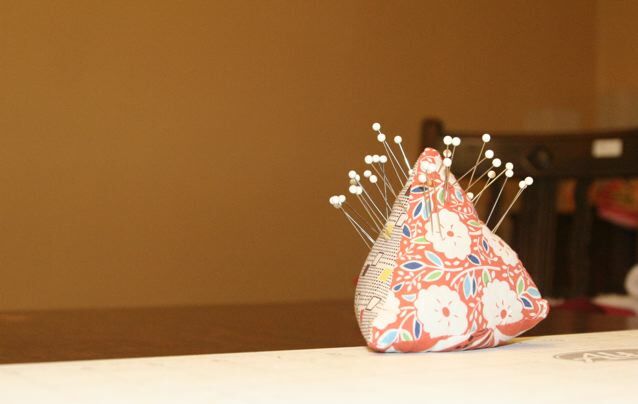 Tamara had mentioned in the last meeting that we should have a pin cushion swap. This made me very nervous, because I'm not that great at 3-D things, or anything that isn't sewing in a straight line. I told all of this to Tamara, and at the end of the meeting she gave me a pin cushion that she had made. How pretty is this! It's weighted at the bottom too, so it's super nice. It sure beats my current pin cushion, which I made in 3rd grade as a 4-H project. 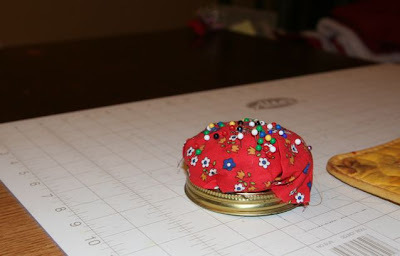 If we ever do a pin cushion swap, I'm pretty sure my swap partner will get one that looks just like this. As Tamara and I were chatting about her awesome pin cushion, Elizabeth walked up to us both and offered us some fabric she didn't want anymore. I don't use a lot of prints, (not that I don't love prints, they're just not what I'm using right now) but it will come in useful for next month's print charm square exchange. So I got a new pot holder, pin cushion and a pretty piece of fabric. What more could I ask for?